Direction (1-5). The given questions are followed by two statements I and II. You have to decide which of the following statements are required to answer the question? Seven persons -A, B, C, D, E, F and G are sitting around a circular table. All are facing towards centre. Who sits 2nd to the left of B? Statement I: F sits second to the right of A. E sits third to the left of F. C sits second to the left of E. B sits third to the left of D.
Statement II: B sits second to the left of A. D sits third to the right of B. G sits second to the right of D.
Statement I: A lives on an even number floor. Eldest among them lives on Odd number floor. One person lives between A and C. Person who lives on floor number 4 is youngest of them. E is elder than B but younger than D. A is elder than B but younger than D. Eldest of them lives on floor number 3. B lives on top floor. A, B, C, D, E, F and G sit in a row having seven seats. All of them are facing north. Who is sitting t o the immediate right of B? Statement I: A sits third to the left of G. Only One person sits between A ad D.
Statement II: Two persons sit between D and B. Only one person sit between B and F. E and C are immediate neighbors. Statement I: E is heavier than A. C is heavier than D. C is not the heaviest of all. Statement II: B is heavier than A. E is lighter than B. A, B, C, D, E, and F are six members of a family. How is D related to F? Statement I: A is father of C. F is son of E. E is the only Son in law of B. D is son of A. B is wife of A. Statement II: E is the father of F. A is the father in law of E. D is son of B. C is wife of E.
Direction (6-10): The given questions are followed by two statements I and II. You have to decide which of the following statements are required to answer the question? 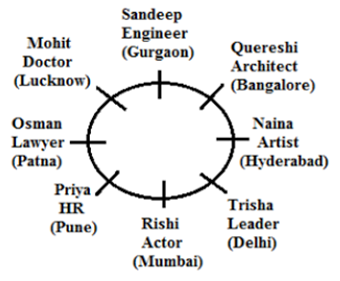 Eight persons Mohit, Naina, Osman, Priya, Quereshi, Rishi, Sandeep and Trisha are sitting around a circular table. They are different in profession. They are going at different places viz., Lucknow, Gurgaon, Delhi, Mumbai, Patna, Bangalore, Hyderabad, Pune. Mohit, a doctor is going to Lucknow. Quereshi is neither HR nor a lawyer but is sitting opposite to HR. Osman is second to right of Sandeep who is an engineer. Rishi is either actor or HR and is going to Mumbai. Neither HR nor Leader goes to Mumbai. Trisha, a leader is third to right of Osman. Naina is an artist and is going to Hyderabad. HR and Actor are sitting adjacent to each other. Rishi, an actor is sitting second to left of Naina and also second to right of Osman. The Architect is going to Bangalore. Engineer is going to Gurgaon while leader is going to Delhi. Priya is not going to Patna. 11. Who is the architect? 12. Who is going to Patna? 13. What is Priya’s profession? How many persons are sitting between lawyer and engineer when counting clockwise from engineer? 15. Who is third to left of actor? Directions (16-20): Study the information carefully and answer the questions given below. 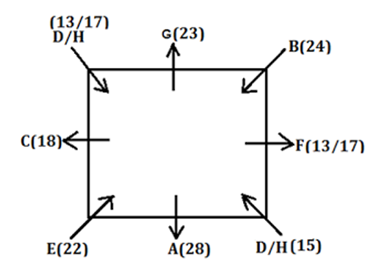 Eight persons A, B, C, D, E, F, G and H are sitting around a square table but not necessary in the same order. Four persons sits at the corner side of the table while other four sits middle side of the table. Person sits at corner faces inside while others faces outside. They also have a different age i.e. 13yr, 15yr, 17yr, 18yr, 22yr, 23yr, 24yr and 28yr but not necessary in the same order.F sits second to the left of A and second to the right of the person whose age is 23yrs. C sits second to the right of the person whose age is an even number more than 22yr. Neither F nor the persons whose age is 23yr is immediate neighbor of C. B sits immediate left of F and his age is 24yr who sits opposite to the one whose age is 22 yr. E sits second to the left of the person whose age is 3yr less than the age of C’s age. C’s age is an even number and E sits at the corner side of the table. Age of G is 27yr less than the total age of A and E.
16. Which of the following sits second to the right of the one whose age is 17yr.? How many persons sits between A and the person whose age is 24yr, when counted left of A? 18. Who sits immediate right of the person whose age is 18yr old? 19. What is the age of the person who is opposite to A? 20. What is the total age of D and H? 12.Who is going to Patna? Who is third to left of actor? Which of the following sits second to the right of the one whose age is 17yr.? Who sits immediate right of the person whose age is 18yr old? What is the age of the person who is opposite to A? What is the total age of D and H?